A lightweight and high performance bullhorn trimmer for professional users. Perfect for gardeners, landscapers and contractors. Features excellent ergonomics and balance, 2-way rotation trimmer head and long-lasting brushless motor. Comfortable harness included. Price includes Brushcutter $599, BLi150 Battery $249 and QC330 Charger $199. Components also sold separately. Versatile brushcutter, perfect for homeowners. Easy starting with Smart Start® recoil system and fuel pump. The X-Torq® engine provides raw power and excellent fuel economy. Comes with double harness, easy loading semi automatic trimmer head and grass knife. Husqvarna 535RJ is a J-handled brushcutter in the versatile 35cc class, built for tough commercial use. Top class performance is provided through raw powered X-Torq® engine, unique ergonomics and excellent durability. 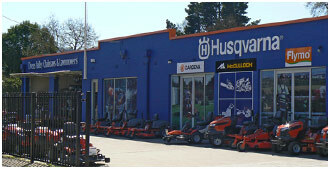 Husqvarna 345FR comes complete with trimmer head, grass blade and saw blade. This flexibility makes it an ideal solution for people who require the benefits both products offer in one, effective package. The X-Torq® engine provides raw power and excellent fuel economy. LowVib® vibration dampening maximises user comfort and control.